For over a decade, CARNEADES experts have been conducting training, seminars and workshops both externally and in-house. Our seminars and workshops perfectly combine the synergies of theoretical principles and practical requirements. The seminars are held by experienced internal or external lecturers with a high level of practical experience. CARNEADES offers a wide range of comprehensive training courses tailored to the on- and offshore wind and grid connection industry. The training seminars cover, in particular, the fields of Contract and Claim Management and are designed for professionals involved at any stage of a project (Development, Construction and Operation). The broad experience CARNEADES gained in the field of the existing contract models– such as LOGIC, BIMCO, FIDIC and EPCI contracts, – will, thanks to various practical examples, improve your contractual capabilities and enable you to foresee potential risk areas. CARNEADES utilises the experience and know-how gained from numerous on- and offshore industry projects to ensure customer satisfaction. Relevant cases are reviewed and analysed while German Construction Law, the contractual framework and legal aspects of individual cases are considered. 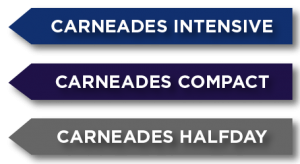 CARNEADES Training offers you three different training-streams. The CARNEADES Intensive training programme is a tailor-made programme that lasts two days and will cover a subject you always wanted to explore in depth. The focus of the course can be adapted to suit your needs e.g. we can present the course material from different perspectives if you, for example, are more interested in project challenges from a Contract Manager’s point of view rather than from a Project Manager’s perspective. Whenever possible, the different points of view will be presented by two different lecturers, to give the participants an even more intense access to the individual training subject. Workshop-activities and open discussion can be included in the training programme. After two days of knowledge transfer the participants frequently forge new business relationships due to intense cooperation during the trainings. Our two-day-trainings take place in renowned hotels and include beside two lunches and the coffee-breaks also “off panel” conversation with our lecturers at the hotel bar in the evening of the first training day. The CARNEADES Compact training programme is a one-day training. These training sessions are held by our internal or external lecturers. The programme can be tailor made to suit your particular needs and topics of interest. The training sessions usually take place at our company location or a seminar-hotel. Coffee-breaks and lunch are included in the participation fee. The CARNEADES half day training programme offers a morning or an afternoon of training in a subject of your choice. The CARNEADES half day trainings usually take place in our modern office facilities at Überseering in Hamburg. You can find all our various training subjects, each one also available as individual staff training, in our list of Workshops.